Forshmak (German: vorsmach) is a stew made from herring, and sometimes also sheep or lambs meat. It has traditionally been eaten in Eastern Europe and in the Nordic countries. It is traditionally served on top of dark and heavy rye bread. This is a recipe for cold forschmak based on herring. 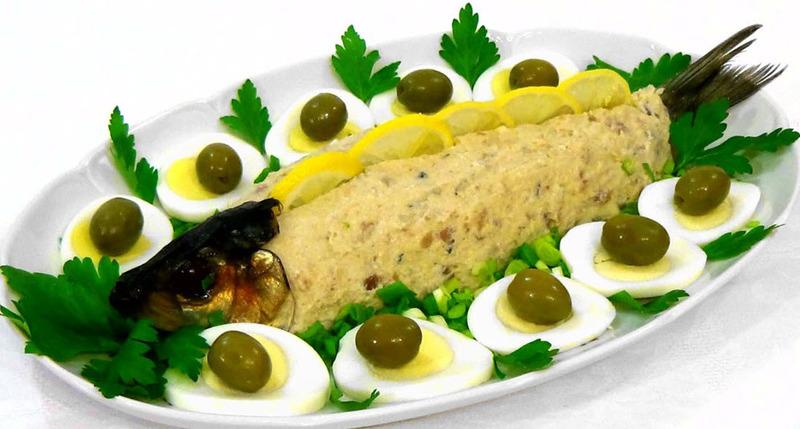 Warm baked forshmak is usually made from both herring and sheep/lamb meat. Peel and chop the apple, onion and eggs. Grind all ingredients together. Blend well. Preheat the oven to medium-low. Cut the herring fillets into very small pieces. Put a frying pan over low heat and add the butter. Cut the boiled meat into small cubes. Set aside. Whip the egg. Set aside. Add sour cream, broth, onion, herring, boiled meat, whipped egg, pepper and salt to the butter in the pan. Mix very well. Heat until its hot (approximately 175 degrees F). Pour the mix into to form, add the breadcrumbs on top. Bake in the preheated oven until the crumbs are golden or lightly brown. Hard-boil the eggs. Separate the yolks from the whites. Set aside. Peel and core the apple. Set aside. In a food processor, blend herring fillets with apple, egg-whites, sugar and bread. Add oil and vinegar, mix thoroughly. Place the mixture in a bowl. Crumble egg yolk on top and garnish with scallions.